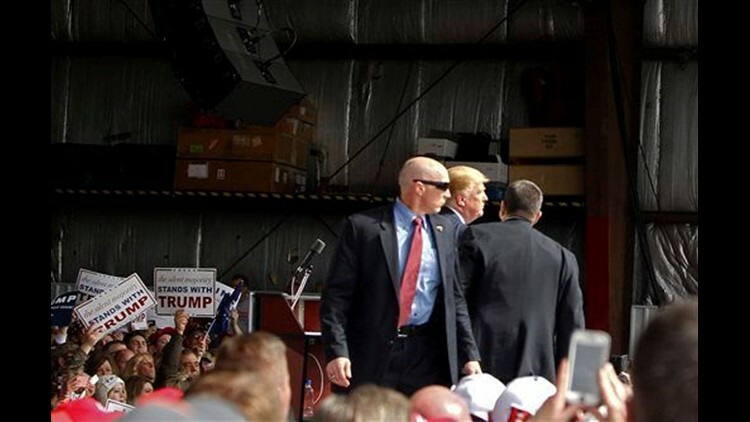 VANDALIA, Ohio (AP) — Republican presidential front-runner Donald Trump was briefly surrounded by U.S. Secret Service agents on stage at a campaign rally in Ohio on Saturday, after someone tried to rush the stage as he delivered a speech in which he blasted protesters for forcing him to cancel an event the previous evening in Chicago. Late into his speech at an airport hangar outside of Dayton, Trump appeared to jolt after hearing something in the audience standing behind his right shoulder. A group of Secret Service agents quickly rushed on stage and briefly formed a protective ring around the billionaire businessman. Almost as quickly, they left the stage and allowed him to continue his speech. Trump campaign spokeswoman Hope Hicks said a man had attempted attempted "to breach the secure buffer." He was removed "rapidly and professionally," she said in a statement. Matt Miller, a Trump supporter who owns a body shop in Dayton, said he was standing near the podium when the agents took to the stage to protect Trump. "We just saw a kid that tried to rush the stage. The Secret Service tackled him right away," Miller said. Trump, who was able to finish this speech without incident after the brief interruption, said from the stage: "Thank you for the warning. I was ready for 'em, but it's much better if the cops do it, don't we agree?" The incident outside Dayton came less than 24 hours after Trump called off a rally in Chicago, after protesters he called "professionally staged wise guys" filled the arena where he was scheduled to speak. He said he was worried his backers would have gotten hurt. "We would've had a problem like you wouldn't have believed," he said. The announcement that Trump would postpone the Friday night rally led a large portion of the crowd inside the University of Illinois at Chicago Pavilion to break out into raucous cheers. Many rushed onto the floor, jumping up and down with their arms up in the air to celebrate. Several said afterward they had organized in advance with the intent of keeping Trump from speaking.